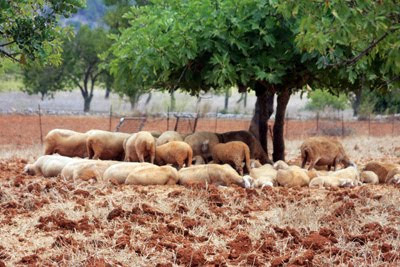 Aún esquiladas, las ovejas han pasado mucho calor este verano. Ahora agradecen la tierra fresca recién removida y la higuera rebosante de hojas que les dá sombra. We have included your blog in our guide Around The World. The guide is both a record of old blogs and a listing of new blogs. Although originally arising from the "City Daily Photo Blog" lists this is an independent publication. Inclusion here does not imply that a blog qualifies for nor is officially a CDPB. Our criteria are that photographs mainly from and related to a specific geographical location (not necessarily a "city" but usually more specific than a whole country or region) are posted at dated intervals (not necessarily daily) and archives are kept which are readily searchable by date. Please keep us informed of any changes to your details.